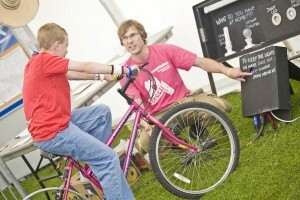 A very educational demonstration which is popular with all ages. As the participant pedals on the bike generator the member of staff turns on the different lights to show how they differ in efficiency. Most young people are able to power the fluorescent (eco) bulbs at roughly 20watts each or the LED spot light at only 3watts. 8year olds are able to power the 50watt halogen spotlight and most 10 year olds can power all of the Eco bulbs together. 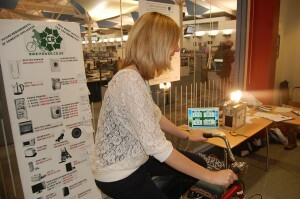 But the real challenge is the 100watt tungsten bulb which you can really feel through the pedals when it is turned on. Most the young people can make it come on but if they don’t keep pedaling really hard there is a bleep as the power drops and the Light goes out. 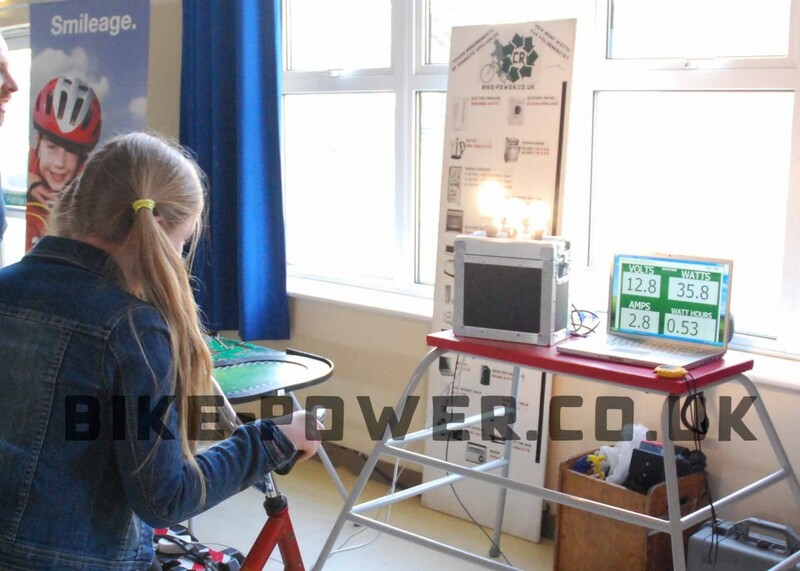 This Demonstration is excellent for giving a tangible understanding of the energy required to power a light bulb. The display is marked up with the wattage’s of all the light bulbs so people are able to take home an understanding of what 50 or 100 watts actually means. After they have taken part we ask them to consider how many cyclists would be needed to power different appliances. Also available with power measurement software for a real-time view of how many watts and watt-hours you can generate! Although slightly more expensive to hire, this demonstration is a lot more accurate and better suited to adults. In combination with our domestic appliance power consumption comparison display board this is the rolls-royce of energy efficiency displays. Please don’t hesitate to contact us for a Quote.